When Henri and I left home in Arkansas on December 20th, 2018, we were supposed to be heading to Memphis for an overnight Christmas adventure, including a carriage ride through the Starry Nights light exhibit at Shelby Farms. A rainy forecast pretty much ruined that, and to make matters worse, it was raining everywhere from Memphis to the gulf. I decided the best I could do was head south. I knew if I could get to the coast, I’d at least find a dog-friendly bar with a covered patio. I threw all my clean (winter) clothes, unfolded, into the biggest suitcase I had; I grabbed my cowboy boots (‘cause you never know when you’ll need those at the beach); and I put Henri in the truck. I didn’t have a plan, or shorts, but I had four pairs of jeans, two swimsuits, my Santa hat, and my cowboy boots! Is anybody imagining the scene from The Jerk right now? My first stop was at Harrah’s Gulf Coast Casino. I called them while driving, and thankfully, they had a Pet Stay room available for us. Nine and half hours on the road was enough and we rolled into valet around 11:30 p.m. Mix & Mingle and room service were both closed for the night and the only open bar was on the casino floor. So I took Henri for a short potty walk, picked the stickers out of his paws, and settled him into our room to rest. Then I headed downstairs to decompress. After a few hours on the floor and a good night’s sleep, we checked out and went to downtown Ocean Springs. I wanted to drop in on one of my favorite shops to see if there was anything I needed. We haven’t been to Coastal Magpie in two years, but the owner recognized Henri right away and pulled a treat from behind the counter. I picked up an oyster shell ornament made by a local artist for a girlfriend who collects such things, and then we hit the road again. Gulf of Mexico to the right. Santa Rosa Sound to the left. 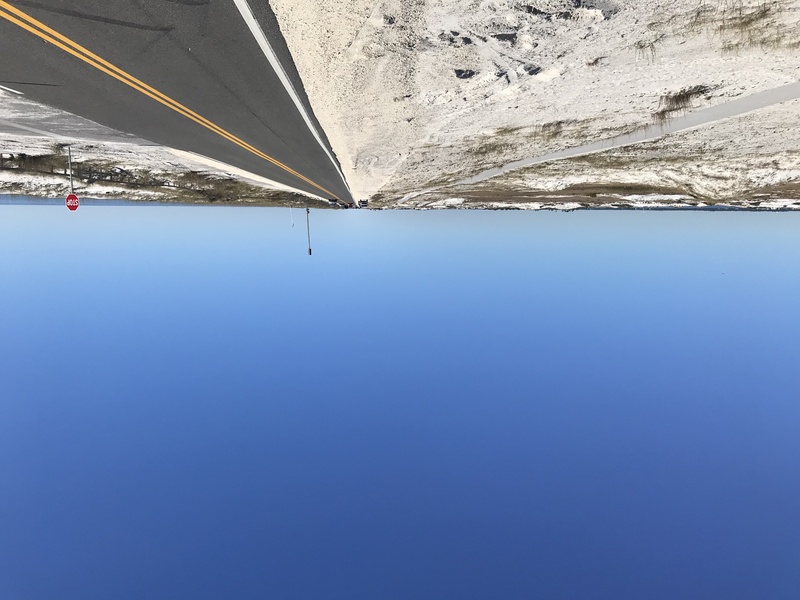 Let me get straight to the point…If you’re headed east or west through Pensacola and not driving the National Seashore, you’re doing it wrong! It’s ok. I’ve done it wrong several times, but not anymore. If you put Gulf Islands National Seashore into your GPS, you’re likely to get the ‘Gulf Breeze Pkwy’ address. That’s not what you want. 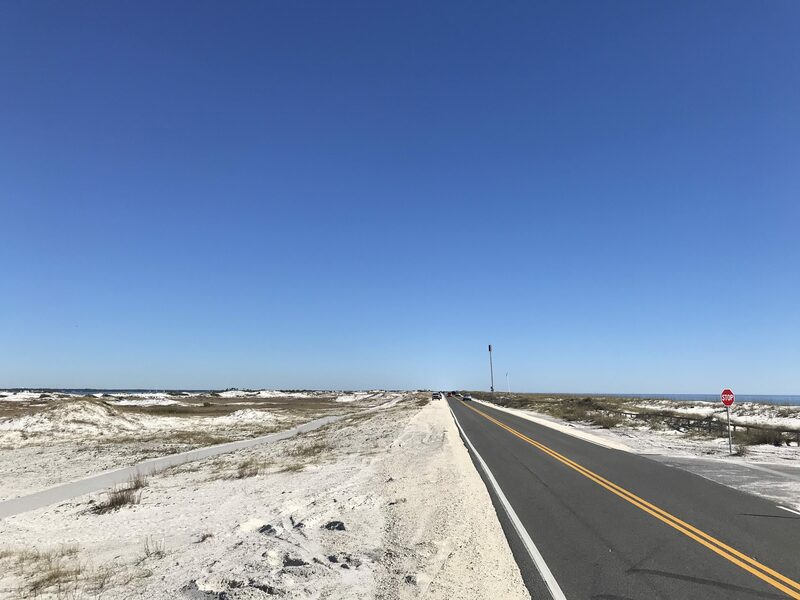 That’s Hwy 98, and while it will get you in and out of Pensacola and old 98 to Destin is still a nice drive, you want the road that runs from Pensacola to Navarre. I used ‘Via de Luna Drive’ but you could also try ‘J Earle Bowden Way.’ If you aren’t starting or ending at Navarre Beach, again, I remind you, you did it wrong. This route will only cost you an extra fifteen to twenty minutes in time, but you will be flanked on one side by Santa Rosa Sound and on the other by the Gulf of Mexico. I did it both coming and going, and even on a cloudy day, it’s beautiful. 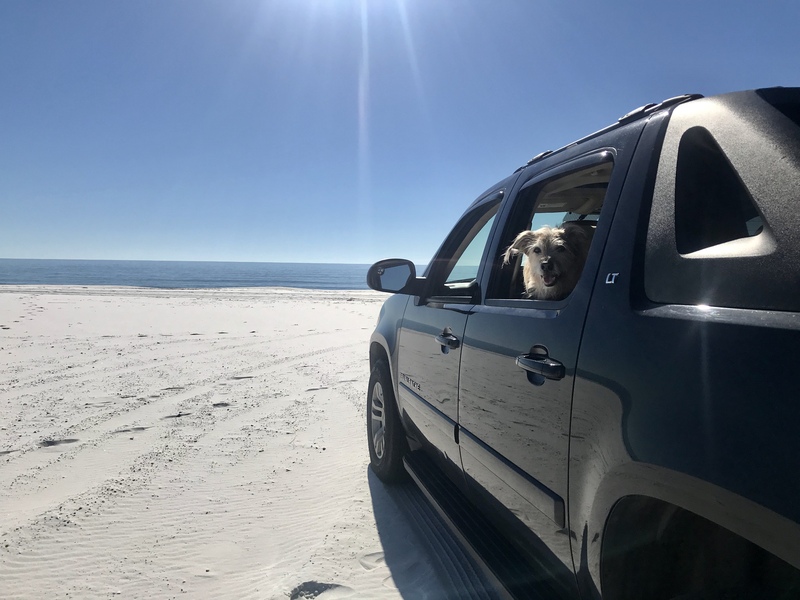 In addition to the scenery, you’ll drive right by the Pensacola Beach Dog Park located on the sandy white shores of the gulf! Pensacola Beach Dog Park East is located at Lot E on Via de Luna Drive. It’s the first parking lot past Portifino Island Resort (not pet friendly). Dogs are required to be on leash at all times and signs denote dog-friendly areas. Poop bags, waste disposal bins, and hand wipes are also available. On our way home, it was a gorgeous day and there were lots of dogs already staking claim to their beach spots, as well as many coming and going. I asked several of what looked to be locals about “leash length” regulations and everyone seemed to think there were none. I was told the beach patrol guys do come through to make sure pets are leashed and well-behaved, but that they are very nice and usually have treats. Pensacola Beach Dog Park East is one of two beach parks on the gulf, both of which require leashes, and one of four parks total. You can find out more about Pensacola’s dog beaches and parks here. Driving Florida from the north to the central area, ditch the traffic, roll down the windows and take a detour through Ocala. One of only five cities, four in the U.S. and one in France, permitted under Chamber of Commerce guidelines to use the designation “Horse Capital of the World,” Marion Co was the first place in Florida to develop a thoroughbred horse farm. 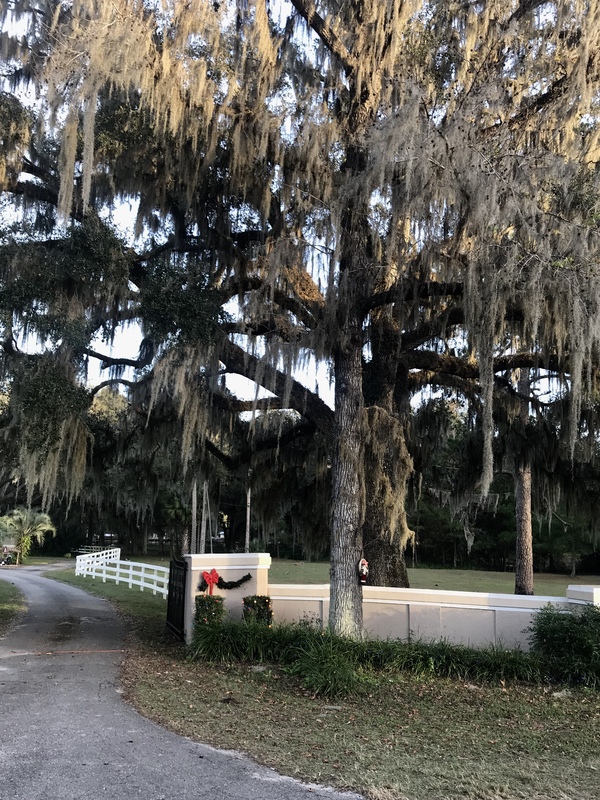 Your detour will take you past picket fence framed farms with rolling green pastures, and down a highway lined with trees dripping Spanish moss from their branches. If it happens to be sunset, then count yourself lucky. For a dog-friendly stop, visit Silver Springs State Park. A natural landmark since the 1870s, Silver Springs is considered Florida’s first tourist attraction. Gateway to the Ocala National Forrest via the Silver River, this is a great place to do some paddling. Please note that while well-behaved pets are welcome in Silver Springs State Park campground, picnic area, and hiking trails, they are not allowed on glass bottom boat tours, nor does the on-site outfitter allow pets in rental kayaks or canoes. You can paddle Silver Springs with your pup, but you’ll need your own boat. The launch fee is $4.00. U.S. Route 17 is a north-south highway that runs from Punta Gorda, FL all the way to St. Mary’s, GA. I was headed south from central Florida and could have taken 75 through Tampa, but I was on a backroad roll and finally enjoying life’s little detours without all the chaos. This road doesn’t have the scenery of the national seashore or Ocala, but it doesn’t have the traffic of I-75. You’ll cross the Peace River, and for at least a small portion of your drive, travel alongside it. If you’re a paddler and the water is up, this is another great stop. I haven’t done it, but I follow the Canoe Outpost @Peacepaddler on Instagram. They have river scenery and dogs. The best roads are traveled with friends. The last three months of 2018 did a number on me, and 19 days and 4000 miles was how long it took me to get back to myself. I hadn’t planned to go all the way to Ft. Myers but the offers kept coming, and since my attitude hadn’t changed, I just kept driving. Getting out of your own space, both physically and emotionally, rolling down the windows, and breathing some fresh air can set you straight. The other thing that sets you straight are friends. Our adventures south started with frustration, but ended with the thought that occurred to me while driving U.S. 17, the lesson I shared at the beginning of this story. Life will always throw you detours. It’s up to you to take the scenic route. I ended 2018 and began 2019 doing just that: three unexpected backroads, sudden opportunities to catch up with old friends, and the reminder that those people- my friends- are the best parts of me.